What is Mr. Herzher's Wicker Indoor Dog House? The Mr. Herzher's Wicker Indoor Dog House is a beautifully crafted dog house that you can keep indoors to protect your pet from company or to use to potty train. It is crafted from Rhino-wicker, which not only looks great, but also won't absorb odors or fluids. 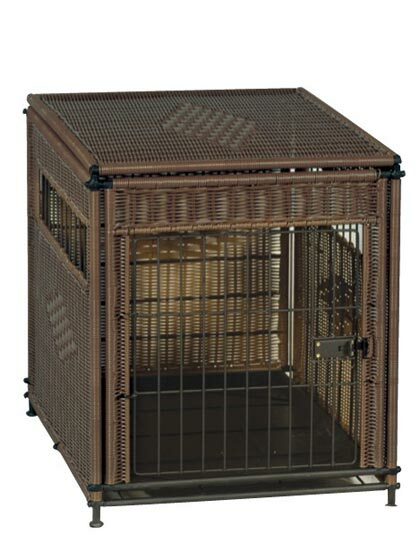 It has 2 doors for easy access and securely latches so your pet will stay safe and cozy. The interior has a double-tough pan that is easy to remove and clean in case your pet has an "accident". It comes in dark brown or natural color to match most home decor. The Mr. Herzher's Wicker Indoor Dog House provides your pet with a safe, comfortable place to stay while you are out of the house, at night time, and when he just needs some quiet time away from the hustle and bustle of life. It is also great for potty training without having to hide an unsightly metal crate. Make sure that latch is fully secured each time you close the door to keep your pet safe and away from possible hazards. Do not leave your pet unattended for long periods of time. Place the Wicker Indoor Dog House in the area of your choice. Throw a blanket or your dog's favorite toy into the dog house. When you are ready to let your pet out of the dog crate, undo finger latch. Do not leave your pet unattended for long periods of time. If your dog seems agitated in the kennel at night or while you are away, try throwing a blanket over the dog crate to make your pet feel more secure.